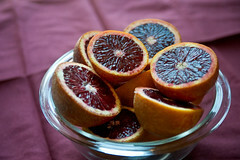 Mix the blood orange juice, the juice of the lemon and the sugar in a blender or until combined. Pass the liquid through a very fine sieve. 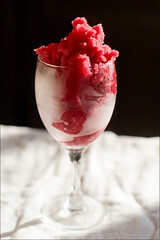 Freeze in a shallow container, stirring every half hour or so until it has a flaky texture. Churn in an Ice Cream machine until ready. Mix juice,sugar, mustard, shallots and vinegar. Slowly whisk in olive oil until combined. Salt and pepper for seasoning. Place all ingredients in a bowl over a pan of simmering water. The bowl must not touch the water. Divide into eight glasses and serve.